This is a totally tricked out GMC Yukon and we added the 4 LED light units to the front for superior vision while pulling sleds at night. 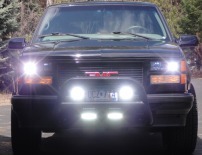 We already have our HID conversions in the headlights, so this was the next step to really cast extra light out in front of the truck. With all these on it will light up the night for sure! All 6 of these lights are a great combo to give near field light as well as cast light far into the distance. 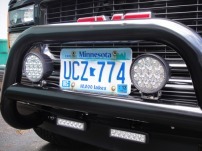 These also help to shine wide off the road into the ditch to see anything trying to cross in front of you like that deer! You can better see the actual LED lights used with them off. The rounds are our 5" 42 watt spots and the rectangles below the bumper are our new driving/fog lights at 6 watts and a.5 amp draw. Both types are post mount. From this picture you can see the depth and body of the LED light units. All cast aluminium housings to make for long life and great heat dispersion.